If you’re sober or trying to quit drinking, fighting the urge to have an evening nightcap can be difficult, especially if having a drink was a regular part of your decompression time before you got sober. It will take time for the urge to dissipate, although it may never fully go away. One way to beat those cravings, whether you’re at the beginning or further along in your sober journey, is to replace it with a healthy, non-alcohol related habit. Preferably, one that’s easy to repeat. Sometimes, after a long day, we’re so exhausted that succumbing to old habits is dangerously easy. When we lack the energy to make clear-headed decisions, we’re likely to slip into the familiar — and in this case, the familiar may just be a cocktail glass or a bottle of wine. And if the slope isn’t slippery enough, cravings for alcohol can seem like a “reward” for an eventful day. “Rewards are powerful because they satisfying cravings. But we’re often not conscious of the cravings that drive our behaviors,” writes Charles Duhigg in his book, The Power of Habit: Why We Do What We Do in Life and Business. For example, “When the Febreze marketing team discovered that consumers desired a fresh scent at the end of a cleaning ritual … they had found a craving that no one even knew existed. It was hiding in plain sight. Most cravings are like this: obvious in retrospect, but incredibly hard to see when we are under their sway,” he adds. This is why cutting nightcaps just isn’t enough; we need to replace unhealthy “rewards” we’ve become accustomed to with new, healthy options. 1. Have a cup of tea. Much has been said about the ritual of tea and its healing power, and it’s not all woo-woo. Herbal teas like Chamomile and Valerian Root are proven to decrease anxiety and improve the quality of sleep. Consider buying whole leaf teas instead of mass-produced tea bags for more potency and taste. 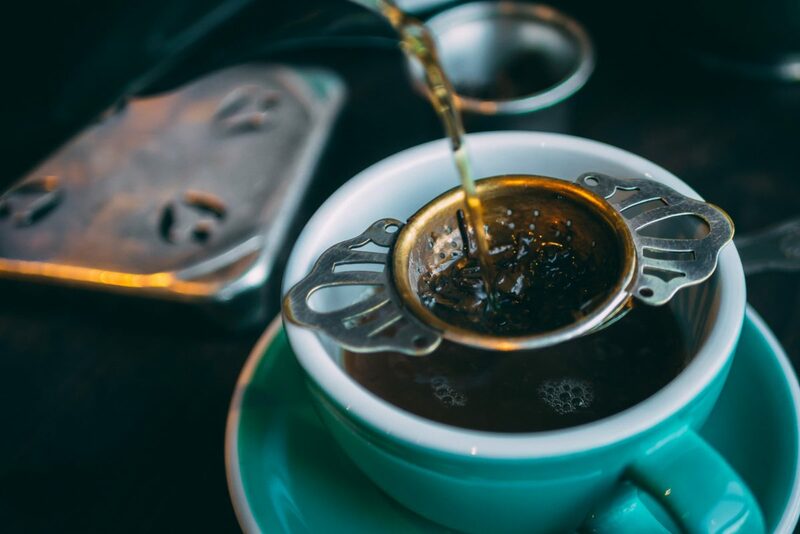 Most tea bags include “dust and fannings,” not complete leaves of the herbs, and therefore don’t pack the full punch of the power of the tea, according to The Tea Spot. Make a tea ritual a special component of your evening wellness practice and enjoy those natural benefits. Breath is taken for granted, as it’s a component of the autonomic nervous system, meaning the act of breathing is automatic, not needing conscious effort. However, breathing with a conscious effort can bring meditative stillness and a sense of calm to the mind, body, and soul. Thoughtful breathing exercises called pranayama, a Sanskrit word meaning breath control, help slow anxious thoughts, and create a mental reset. Place one hand above your belly button and the other hand on your chest as you slowly breathe in, allowing the hand on your belly to rise, and fall as you breathe into and from your diaphragm. The hand on your chest should remain still. In her book, The Artist’s Way: A Spiritual Path to Higher Creativity, author Julia Cameron touts the benefits of writing morning pages (three pages of stream of consciousness writing done each morning). The act of clearing your mind without any sort of directive or pressure other than brain-dumping is great in helping you achieve clarity throughout your day. It doesn’t matter what you write, as long as you write something. Whether you maintain Cameron’s morning pages approach or write stream of consciousness in your journal during the evening, the routine fills time otherwise spent drinking. 4. Work in your planner. In a world of digital scheduling tools and calendar apps, nothing can replace the tactile pleasure of writing in a beautiful paper planner. From the classic Moleskin to the gorgeous Ink+Volt to the creative Passion Planner, paper planners have evolved in style and substance. After choosing a planner that works for you, set thirty minutes aside each evening to check off the day’s to-do’s and schedule tomorrow’s. This evening habit will help you stay on top of your game while also encouraging you to review and celebrate how far you’ve come in achieving your previous successes. 5. Enjoy a moment of silence. Even if you’re not religious or spiritual, prayer or meditation can just mean taking time for yourself. Find a quiet space in your home — it could be your bedroom, a cozy corner in the living room, or the bathtub or shower — anywhere you feel the most comfortable. If you’re somewhere you can sit, sit on top on your legs with them bent underneath or in any other position in which you are comfortable. If you’re in the shower or unable to sit on your legs, stand or rest as comfortably as you can. Take a few slow breaths and thank yourself for being present, for all the things you did today and for all the things you will do tomorrow. Making a mental gratitude list, or even writing it down, can also be calming. The most important thing is to just be still, wrap yourself in a mental hug and embrace the loving internal dialogue. Changing up your evening routine doesn’t have to become a spiritual reinvention. It can be as profound or as mundane as you see fit. Ultimately, it’s your life and something that works for you may be a disaster for someone else. Be flexible in trying out new habits. If something doesn’t feel natural after a few attempts, shake it up and try something else. Remember: Perfection is a scam. The only thing that truly matters is finding your own unique path to healthy and sustainable living in sobriety.